Is Hollywood Gothique the only haunt-hunter whose PKE meter has pinpointed Griffith Park as Spook Central of Halloween in Los Angeles? Home of the famous observatory, the Greek Theate, and the Los Angeles Zoo, Griffith Park may seem sylvan and placid - a home for harmless squirrels rather than dangerous demons - nevertheless, five Halloween events take place in the park every October, running the gamut from family-friend fun to adult-level horror. Looking for a kid-safe Halloween treat? There is Boo at the Zoo. Want something for adults? There is Night of the Living Zoo. Interested in creepy classic music for the whole family? Check out Eek at the Greek. Want to go for a ride? There are two: the spooky, special-effects-filled Los Angeles Live Steamers Ghost Train, and the terrifying L.A. Haunted Hayride. Unfortunately, not all of these events occur on the same dates; even if they did, there is no way you could attend all of them in a single evening. 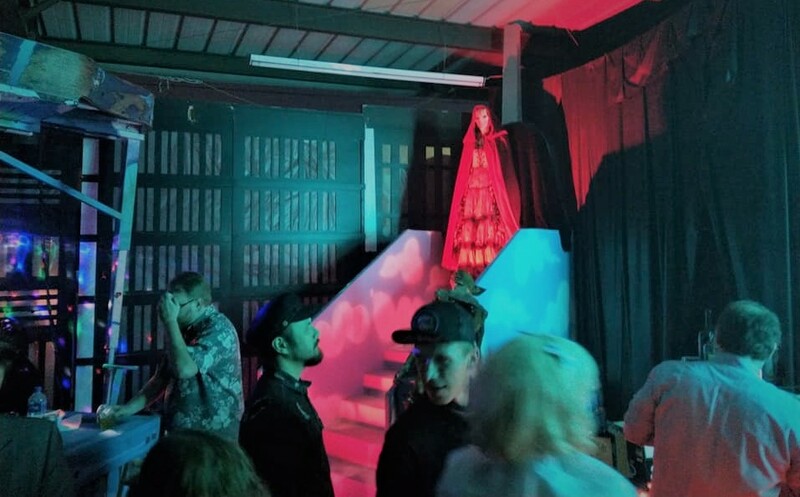 Nevertheless, we are assembling them here in this Haunted House Itinerary, so that avid haunt-goers may select their own form of destruction from the range of possibilities. Choose and perish! Hours: 10am to 4pm on all days. Special Preview (zoo members only): Saturday, October 18 from 8:30am to 10am. Description: The Los Angeles Zoo resurrects its annual Halloween event for children. This year's activities include: jack-o-lantern carving demonstrations, photo opportunities, and crafts. Visitors are invited to view Creepy Creatures in the Winnick Family Children’s Zoo, followed by a live Halloween show in the Adventure Theater. Children can also learn scary animal facts about the zoo's animals. There will be trick-or-treating opportunities throughout the zoo. Boo at the Zoo is included with the regular price of zoo admission. GLAZA members get in free. 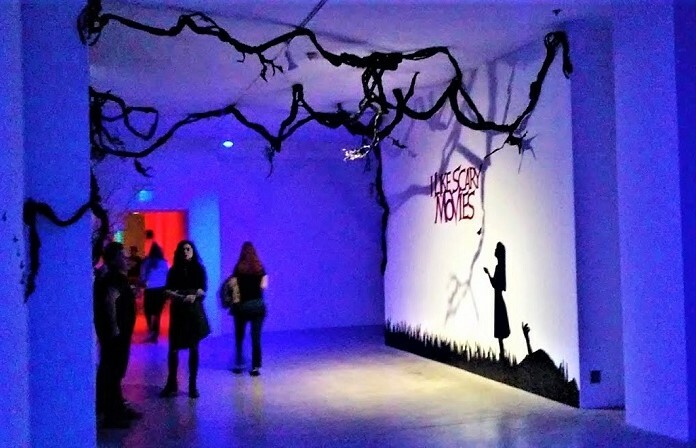 Description: Looking for family-friendly Halloween fun in Los Angeles? Look no further! 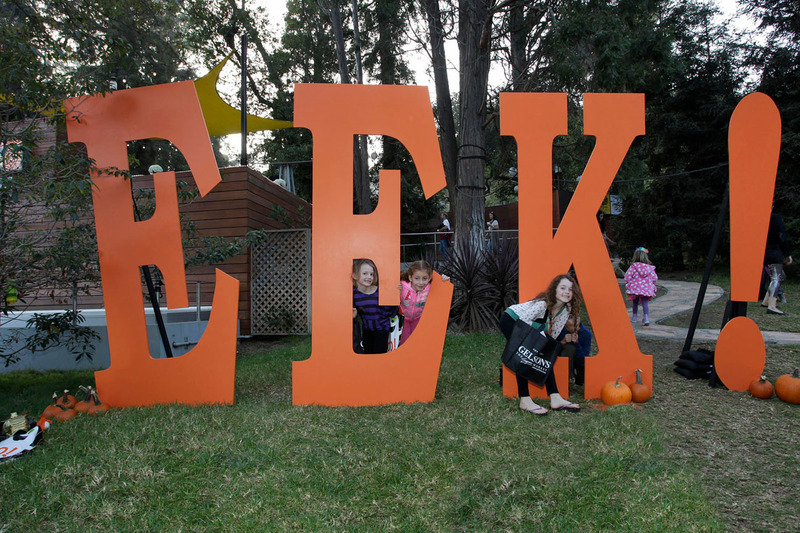 Eek at the Greek returns for its fourth season, offering Halloween treats for the whole family, including scary symphony music and a Trick-or-Treat village. Presented by the Children's Hospital of Los Angeles, Eek at the Greek features the 60-piece Symphony in the Glen Orchestra, which Arthur B. Rubinstein will conduct in a series of performances including Igor Stravinsky's "Infernal Dance" from THE FIREBIRD; Camille Saint-Saens "Funeral March of the Marionette" (commonly known as the theme to the old ALFRED HITCHCOCK SHOW); and "The Devil Dance" by John Williams. Also, actor Bruce Boxleitner will narrate Poe's "The Tell-Tale Heart" with musical accompaniment, and there will be a world premiere performance of new live music by Carl Stalling, set to Disney's classic 1929 Silly Symphonies cartoon, "Skeleton Dance." The Trick-or-Treat Village will be open from 4:30pm to 6:30pm in the front plaza of the Greek Theatre, where children can enjoy face-painting, a costume contest, safe trick-or-treating, and other arts and crafts. Musical performances begin at 7Pm. The finale of the costume contest will take place on stage during intermission. Dates: weekends and some week days through October 31. Hours: 7pm to midnight on Fridays and Saturdays; 7pm to 10:30pm on other days. 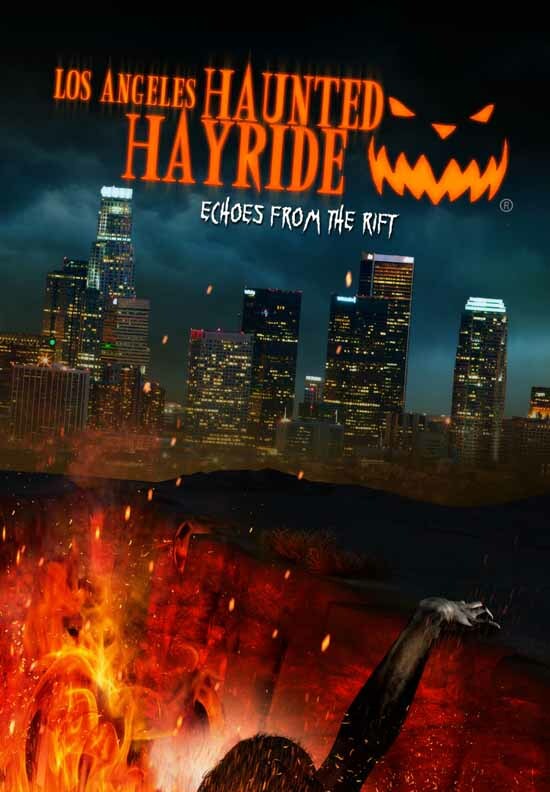 Description: The Los Angeles Haunted Hayride returns for its sixth season of Halloween Haunting! This year's theme is the apocalyptic "Echoes from the Rift," which explores what happens when the gates of Hell yawn open to disgorge a horde of demons upon the Earth. Besides the Hayride itself, the event will include two new attractions: House of the Horsemen and Seven Sins Sideshow. Other entertainment includes the interactive Theatre Macabre and the In-Between Dark Maze. The carnivalesque Purgatory area will again include a Scary-Go-Round, a House of Mirrors, Psychics, Freak Shows, a pumpkin-carving shack, and Death Row (which allows a look at deadly devices from history). The L.A. Haunted Hayride's 2014 upgrade is a wonderful spectacle. The new theme yields some excellent scenes and characters; though the new mazes are not stand-outs, the hayride itself feels reinvigorated and almost totally new. Tickets are $30 for General Admission; $42 for All Attraction Pass; and $58 for the no-waiting VIP pass. The latter two allow access to the new mazes, House of the Horsemen and Seven Sins Sideshow. 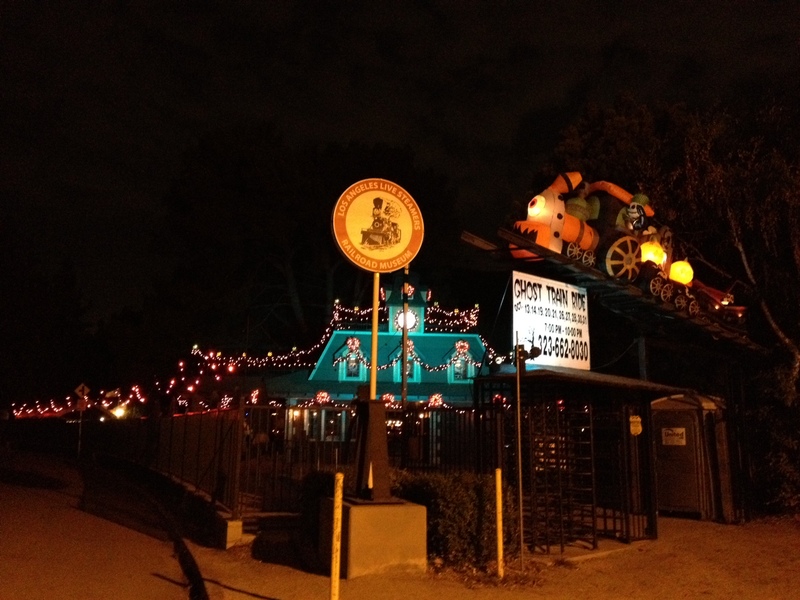 Description: Los Angeles Live Steamers Ghost Train returns for Halloween 2014. This twenty-minute ride on a 7 1/2-inch gauge model train takes guests past dozens of spooky scenes, including elaborate decorations and special effects. The effect is eerie and perhaps just a touch scary, but not disturbing at all - there are no costumed characters or jump scares, and even young children should enjoy the ride. The Live Steamers Ghost Train was Hollywood Gothique's pick for the best Halloween ride of 2013. It has improved greatly over the past few years, so if you have not seen it recently, you should mark a place for it on your schedule. Tickets are a $10 donation for the non-profit Los Angeles Steamers Society, which maintains and runs the train year-round (without the Halloween scenery). Date: Friday, October 24, from 7pm to 11pm. As an extra-added bonus feature, the cast of Drama After Dark will be on hand to provide their patented performances of Edgar Allan Poe and Edward Gorey. These five Halloween events are within seven miles of each other; travel time to reach all five destinations would be less than fifteen minutes. We think your best bet would be to get to the Ghost Train and the Haunted Hayride on a single night, then perhaps get to Night of the Living Zoo on October 24. On October 25, parents might take the kids to Boo at the Zoo in the morning and afternoon, then head to Eek at the Greek for the Trick-or-Treat Village starting at 4:30pm. Destination D: Eek! at the Greek!